An indispensable part of this reform process has been active and dynamic participation of the Community at large. The community has played a pivotal role in the reformation of this prison. The spirit and enthusiasm of the general public has been so high that the individuals came forward with a single pen, a dictionary and even with a single computer mouse to be a part of this campaign. In fact the entire reformation process has been made possible due to combined efforts of the Community, Prisoners and the Prison officers. We are indebted to the individuals from the community who are not associated with any organisation but actively participated in the process of reforms. Last but not least we are indebted to the inmates of this prison for contributing in the reformation activities. Patanjali Yog Peeth Trust, Hardwar: It is a trust founded by Swami Ramdevji. The trust is supporting us in Yoga and other stress management programmes. Swami Ramdev himself visited this prison to enlighten the inmates. The trust is also supporting various reform projects including education and vocational training. Our special gratitude to Awan Parashar and Subhash Suman of Amritsar Chapter of Patanjali Yog Peeth. Pingalwara Charitable Society, Amritsar: We are thankful to Pingalwara Charitable Society for providing blankets, clothes for the inmates and spiritual books for the library of Amritsar Prison on regular basis. Guru Nanak Dev University, Amritsar: GNDU Amritsar is supporting our education project and it has opened a regular study centre in our jail for vocational education of the inmates. Our sincere thanks to Prof. Dr. Jai Rup Singh,Vice-Chancellor and Dr. RK Bedi, Professor and Director, Department of Adult Continuing Education and Extension of the University. Besides this, students of Law department and other faculties are conducting research projects on the various aspects of prison and prisoners. UNODC (United Nations Office on Drugs and Crime), ROSA, New Delhi: The UNODC has launched H-71 project in Amritsar Prison in collaboration with India Vision Foundation. It is a peer led intervention to bring awareness about drugs and drug-driven HIV. We extend our sincere gratitude to Mr. Gary Lewis, Dr. Jayadev Sarangi and Dr. Suruchi Pant for taking keen interest in this project at our prison. 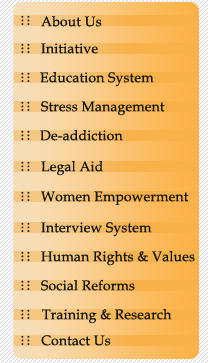 India Vision Foundation: It is a trust dedicated for prison reforms founded by Dr. Kiran Bedi. The foundation has opened its Punjab Chapter to support various reform activities in Punjab Prisons. Kunwar Vijay Pratap Singh has been made coordinator of Punjab Chapter. The foundation is supporting Education project, Vocational training and awareness programmes in Amritsar prison. A Computer Education Centre has been started in the Borstal Jail Ludhiana for the young inmates. Rotary Club Amritsar: Rotary Club Amritsar is an active partner of Amritsar Prison right from the very beginning of the reformation campaign. In fact, the various Rotary Clubs of Amritsar are associated with each and every reform project undertaken in this jail. Rotary Club Civil Lines has organized a number of health camps, eye camps and also donated goggles to the poor and needy inmates. Our sincere thanks to Dr. Kiran Duggal and Mr. Gurjeet Sekhon and other Rotarians of this club. The NIIT centre of Amritsar run by Mr. Sekhon has also donated Computer books for the Computer Centre of the Jail. Rotary Club Amritsar Main is supporting the vocational training programmes for the female inmates of Amritsar Prison. We are thankful to Rtn. Sudarshan Kapoor, Rtn. Sumant Sud and other Rotarians of this club. Rotary Club Amritsar South is extending all round support to De-addiction, Vocational training and literacy projects. We are grateful to Rotary Club Amritsar South for web designing and maintenance of the website of Amritsar Prison. Our sincere thanks to Rtn. Randeep Singh Arora, Rtn. PP Upkar Singh Sethi, Rtn. PP Surjit Sharma and other Rotarians of this club. Krishi Vigyan Kendra, Amritsar: It is a joint venture of ICAR and PAU (Punjab Agricultural University. Krishi Vigyan Kendra is providing us expert guidance in the projects related with empowerment of women through its Home Science Wing. Vocational training in candle making, food preservation, tie & dye, fabric painting and toy making is being imparted by the experts of KVK. In the next phase, we are going to take assistance in horticulture, floriculture, vegetable growing and crop production. We are especially thankful to Dr. Paramjt Singh, Dr. Sukhminderjit Kaur and Ms. Shaminder Bawa for taking keen interest in the prison reform projects. Punjab Social welfare Board: Punjab Social Welfare Board is assisting us in various projects related with women and education of children of the inmates under Border Area Project. Our sincere gratitude to Mrs. Ratna for taking keen interest in prison activities. BPR&D (Bureau of Police Research and Development): BPR&D is providing us valuable guidance in modernization projects. We are grateful to Dr. Kiran Bedi, DG, BPR&D and Dr. B.V. Trivedi, Assistant Director for taking personal interest in the reformation process of this jail. BPR&D has also organized a training programme SEEING IS LEARNING in Amritsar Jail for the Prison officers of North India. State Bank of India: State Bank of India is assisting us in Computer education and Vocational training under its Corporate Social Responsibility. We are grateful to Sh. Shyamal Kanti Das, DGM, Punjab and Sh. Akshay Mehra, Regional Manager, Amritsar for their continuous guidance and support. Spice Telecommunications: We are grateful to Spice telecommunications for assisting us in computer education as well as for providing regular technical support under its Corporate Social Responsibility. Our sincere thanks to Bimal Kumar, Ritesh Kumar and Sandeep Kumar for their continuous cooperation. SGPC (Shiromani Gurdwara Parbandhak Committee): The SGPC is providing us regular support for the religious and spiritual activities. It has also provided infrastructural support and religious books and other literature for the inmates. Prajapita Brahma Kumaris Ishwariya Vishwavidyalaya: We are grateful to the Amritsar Chapter of Brahmkumaris for organizing spiritual events regularly for the inmates and officers. Our sincere thanks to Dr. S. P. Popli for taking keen interest in prison activities. Art of Living: Art of Living organizes regular sessions in Amritsar Jail. We are thankful to Veena Mishra, Sandeep Sandhu, Raman Aggarwal and Anish Dua from Art of Living. Kundan Vidya Mandir: Kundan Vidya Mandir, Ludhiana is supporting us in the education of the children of the inmates of the Women Jail Ludhiana. We are thankful to Sh. S. C. Saxena, Principal of the school and Mrs. Anu Sehra, Mrs. Sonia Verma and Mrs. Manisha Gangwar for their guidance and support. Chaturvidh Yog Asharam: Chaturvidh Yog Ashram, Amritsar has organized Yoga camps in Amritsar jail regularly. Our sincere thanks to Brahmchari Satyanandji and Pawan Kumar. Bharatiya Vidya Bhawan, Amritsar: Bharatiya Vidya Bhawan Amritsar has extended full support for the education of the inmates of this jail. We are thankful to Sh. Avinash Mahindru, Chairman, Bharatiya Vidya Bhawan, Amritsar for his continuous support and guidance. Member of Parliament: Mr. Navjot Singh Sidhu, Member of Parliament, has extended full support to the reform activities of this jail. He donated Rs. 1.5 lakhs from his own pocket for providing fans and cots to the inmates. IGNOU: Indira Gandhi National Open University has opened its Special Study Centre in the Central Jail Amritsar. More than 100 inmates and officers are enrolled with the IGNOU for various courses. District Legal Services Authority: We are grateful to the District Legal Services Authority for providing legal aid to the poor and needy persons. Our sincere gratitude to Sh. Gurdev Singh, District & Sessions Judge and Sh. Varinder Aggarwal, CJM Amritsar for taking keen interest in the process of reformation of this jail. Lawyers for Social Action: We are grateful to LSA for providing free legal aid to the poor prisoners of this jail. Our special thanks to Advocate Aman Sharma and Advocate Satwinder Singh of LSA, who have taken up a number of cases of poor inmates. Amritsar Bar Association: We are also thankful to spirited lawyers of Amritsar District Bar Association in providing free legal aid to the poor prisoners. Miracle Technologies: We are grateful to Miracle Technologies Jalandhar for providing us technical support and web services. Civil Defense, Amritsar: We are grateful to Sh. Surjit Sharma, Dy. Chief Warden, Civil Defense Amritsar for providing valuable guidance and support. Red Cross Society: Punjab Red Cross Society has undertaken various programmes to bring awareness about HIV/AIDS. Last but not the least; we are grateful to the spirited individuals of the society, our inmates and their relatives for coming forward to join hands to take this campaign to its logical end. Some of the prominent partners of Prison reform are: Deputy Suptd. Sh. Vijay Kumar, Sh. Ashok Kapoor, Sh. Ashwani Kumar (Advocate), Dalbir Singh, Sh. Harjinder Singh Khurana, Baba Gurpinder Singh Ji, Sh. Kishan Parkash, Sh. Bhupinder Singh, Sh.Kanwarpreet Singh , S. Gursharan Singh Babbar, Sharan Press, Hall Bazar, Amritsar, Sh. Kamal Arora , Sh. Joginder Kumar, Sandeep singh Laali , Shri Jaskirat Singh (Vivek Acadamy), Bikramjit Singh, Jagdeep Singh, Ashwani Kumar Dogra, Adv. Gurbaksh Madan.